The Spanish National Honors Society was established in 1953 and is a nationally recognized society for students who excel in learning the Spanish language. It is sponsored by The American Association of Teachers of Spanish and Portuguese. The society was created at North Springs in November of 2012. The sponsor is Señorita Laura Romero. This is Señorita Romero’s first full year of sponsoring this society, after she inherited it from Señora Enhicis Viamonte, who left North Springs in the 2013-2014 school year. Even if you do not take the Spanish class anymore, you can still be in the society. The only requirements include: the student must be at least in 10th grade, have taken at least three semesters of Spanish or Portuguese, and maintain at least an 88 or higher average in the class. If you have already met these requirements, you can still be a part of the society to keep practicing Spanish or Portuguese and also receive community hours. Old members must complete 20 hours of community service, 10 of which have to be in Spanish/Portuguese. Last year, the members went to Woodland Elementary School and made maracas with the students and taught them Spanish songs. Members have other out-of-school opportunities to earn community hours, and can also earn hours within North Springs. Members are trained to tutor students who are taking Spanish or Portuguese and can earn community services hours that way. When members complete their senior year in the society, they will receive a graduation cord specifically for the society. Señorita Romero states that this is a great opportunity and a high honor to receive. 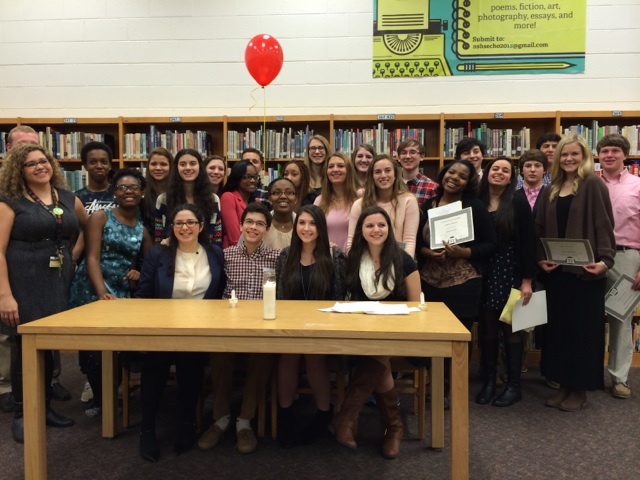 Spanish Honors Society inductions were held on Tuesday, January 27, 2015 in the media center at North Springs. Jami Bohrer, the president of the society, along with treasurer Seth Hochman, secretary Mandy Peskin, and vice president Alexa Rakusin led the induction night. Inductees repeated an oath in Spanish and then in English, and lit each other’s candles with the Mother Candle and lastly, received a certificate. Congratulations to all the new members! ¡Felicidades! ← MLK Day: has the dream come alive?